This was such a lovely job to do. 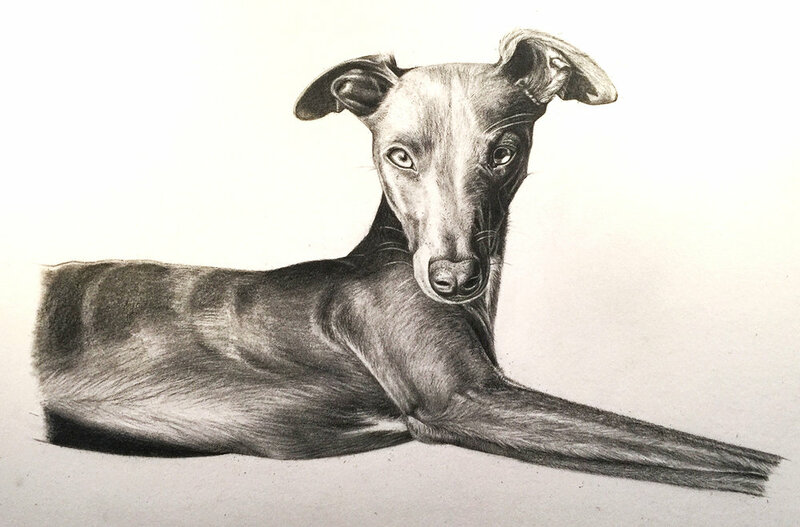 Obviously, as I am a whippet owner myself I am hugely biased to whippets being the most beautiful dog and I am always excited when I get one to draw. I was determined to get this as photoreal as I could. The actual photo was not that high res, so the drawing has to be a little more detailed. The piece is a decent size which is 22 x 15 inches, which will be a pretty big piece once mounted and framed and will look lovely. I time-lapsed the whole drawing. Starting out with a gentle pencil sketch, then slowly building up the layers of pencil and shading. I used my favourite paper which is arches 300 pounds hot pressed, which allows you to really work into the paper with a pencil. It is quite forgiving allowing you to rub out mistakes, and is smooth so you can get fine detail. The drawing took me about 3 days to do and I am pretty happy with the results.